Headlines are meant to command your attention. Think of the front page of our daily newspapers, the News at Ten summary before the Big Ben bongs and the way our gaze is snagged by the headlines on the front cover of glossy magazines as they sit on the shelves, all fighting for our attention. 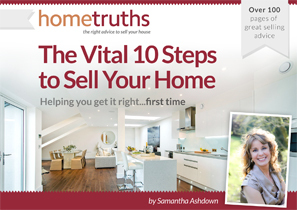 Much better to have a simple and punchy headline of no more than 15 – 20 words that tells the buyer straight away why they need to book a viewing. If you are looking for a view it doesn’t get much better than this. With a tantilising touch of Tuscany, if the tree-lined drive hasn’t sold it to you, the 4 acres of grounds will. Like a Saville Row suit, this house has been created to last the test of time. Use individual and unusual words – forget ‘spacious’ and ‘well-presented’, and go for adjectives that will really grab our buyer. Capture the essence – what is it that is unique and special about your home? Keep it short – with the exception of the Tuscany headline above, all the others are less than around 20 words. Struggling to create a catchy headline? Email me with a link to your property advert, and I’ll see if I can help.